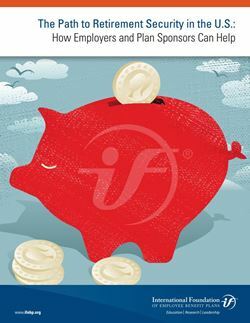 In the early years of the shift from defined benefit (DB) to defined contribution (DC) plans, most attention was directed at saving for retirement. Today, there is a growing realization that more consideration must be given to decumulation—account withdrawals after retirement. 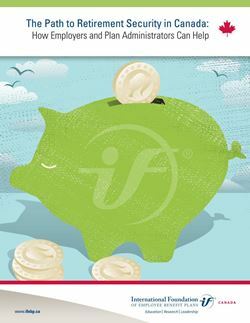 For workers who want to turn their retirement savings into a guaranteed stream of income, several options referred to as retirement income generators (RIGs) are available, with features that continue to evolve. Investment earnings. Invest the assets, leave the principal intact and spend just the interest and dividends received on the assets. Systematic withdrawals. Invest the assets, then use a structured approach to draw down the principal and investment earnings (e.g., a percentage of savings that may or may not be adjusted for inflation). Annuities. Transfer some or all of one’s savings (and longevity risk) to an insurance company that guarantees an income for a specified period of time or for life. Learn more about decumulation strategies in these reports prepared by the Foundation. Each option has pros and cons—and the income a retiree receives depends significantly on the strategy chosen. It is not uncommon for a combination of strategies to be the best choice. Unfortunately, the number of choices is so complicated that if they aren’t forced to do so, many individuals choose nothing. The expenses individuals incur with decumulation are another concern. Too often, retirement savings are turned into annuities at retail prices, which can reduce a retiree’s income by as much as 30%. One exception is annuities for males in the U.S. purchased through DC plans—Federal law requires these annuities be priced on a unisex basis that doesn’t adjust for the fact than on average, women outlive men. For this reason, males with a DC plan in the U.S. may be able to purchase single life annuities at a lower price outside their workplace retirement plan than within their plan. 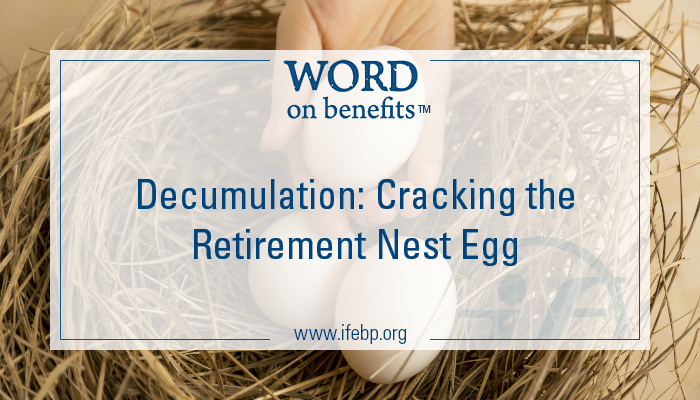 Making a decumulation strategy the default distribution option for a DC plan to discourage lump-sum payouts at retirement. The most popular choices among sponsors establishing default decumulation are annuities and the use of professionally managed accounts with systematic withdrawals. A relatively new choice is a target-date fund that includes a decumulation feature—an effort by the financial industry to address multiple accumulation and decumulation issues with one product. In Canada, the federal and provincial governments have established several default vehicles known as retirement income options (RIOs), where funds from registered retirement accounts must be moved when a saver wants to start making withdrawals. These RIOs have government-established annual minimum/maximum withdrawal amounts. Some RIOs also require the purchase of annuities by a specific age such as 71 or 80. In the U.S., if a DC plan sponsor has an affiliated DB plan, another decumulation option is to transfer some or all of the participant’s DC funds to the DB plan under IRC Section 414(k). The money from the DC plan is converted to an annuity payable from the DB plan. Given the current low interest rates used by insurance companies when pricing annuities, the 414(k) transfer approach can provide a substantially higher lifetime retirement income to the plan participant without adding any measurable risk to the DB plans’ funding.